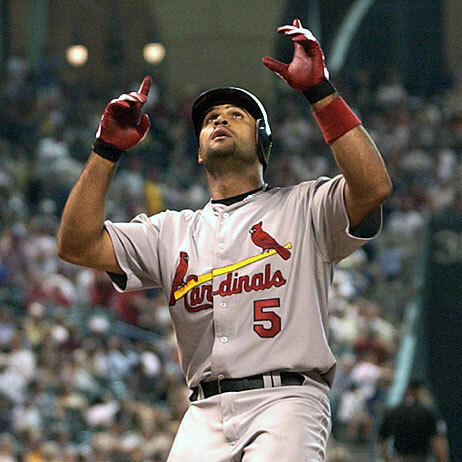 Earlier this morning former Cardinal Albert Pujols; the MLB’s most coveted free agent signed a 10 year $250 million contract to play for the Angels. Making it the third largest contract in MLB history; behind Alex Rodriguez’s Rangers and Yankees contracts. The contract will more than likely be the last of Pujols’ career, as it will take him to the age of 41. The Angels just landed the guy their offense needed after finishing 19th in the MLB in runs scored last season. He’s arguably baseball’s best hitter and has been since he emerged into the league as a 21 year old back in 2001. Pujols is regarded as one of the few clean stars during the tainted steroid era, and is a lock as a first ballot Hall of Famer. Pujols is well respected in the MLB because of his style of play and the way he conducts himself on and off the field. This signing will put the Angels back as the favorite in the A.L West in place of the Rangers, who will more than likely also lose their top pitcher C.J. Wilson this offseason; who is rumored to potentially be heading to South Beach to join the Marlins. The Angels finished 86-76 in 2011 and 80-82 in 2010, both their worst seasons since 2003. Pujols, who averages slightly fewer than 41 homers a season is going to completely turn this offense around as it puts a bat in the line-up that pitchers really fear since Vladimir Guerrero was in his prime. Although a quarter of a billion dollar contract is a lot to fathom, I see this is a great signing by the Angels as they land the MLB’s best all-around player. This entry was posted in Everything Else and tagged angels, contract, mlb, pujols by davecouture. Bookmark the permalink.